For sites that have a lot of older, outdated content (like blog posts and press releases) NationBuilder has a "Legacy" solution that will keep the pages intact, without you having to go to the trouble of recreating everything. 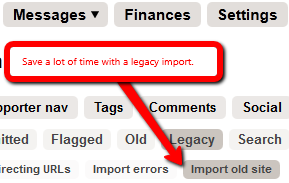 On NationBuilder, before you shut down your old site, you can do a "Legacy import" that recreates all of the pages and content from your old site in kind of a 'frozen' state (meaning that you can't edit these pages like you would a normal NationBuilder page). After you bring your URL over to your new NationBuilder site, if someone tries to go to one of your older posts directly, it will still be there. However, it will look exactly like it did on your old site. Any of the links that are on the legacy page that happen to have the same slug on the new site will work. However, any of the links that have changed slugs or no longer exist will not work. For example, let's say that on the new site and on the old site, there is a "Blog" button in the navigation. If on the old site, the blog slug was /blog and on the new site, the blog slug is /blog, then the link will still work and will take the user to the blog on the new site. This will not be the case for all pages though. For pages on the old site that do not have an equivalent page on the new site, with the same slug, the Legacy will have your back. Sure, the old pages won't have the same look and feel as the new site, nor will they be editable, but at least the user will be able to view the page if they happen to go directly to the URL. The final thing to consider when deciding whether the legacy URL will suffice, or if you need to recreate some of your old content, is if you want the pages to be accessible via the pagination of your blog or other content feed (the "previous" and "next" functions at the bottom of the page). Legacy URLs will not feed into the pagination. The bottom line is, if the old posts on your site do not have much traffic, then the legacy URL might suffice just fine and save you a lot of time and effort. It's time consuming to recreate all of the old content, and then you would have to create redirects from all of the old URLs to the new pages. If all you want is for someone to see the content if they happen to stumble upon it, then the legacy function is a great way for you to save time while preserving the content from your old site.